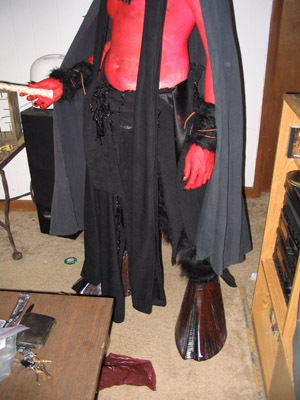 So what happens when you have access to a ton of prosthetics and costume suppliers? Well, you go overboard and start making extensive costumes that you will only wear once. For Halloween 2004, Mike and I decided to tackle an amazing movie from our youth, Legend, starring Tom Cruise, Mia Sara, and Tim Curry. Being the tall one, I got to don the Darkness costume, and Mike’s hair earned him the role as Jack. In retrospect, after having to endure 5 hours of make-up, I would gladly trade Mike roles in the future. But in the end it was all worthwhile, and we have these great photos to show for it. And more importantly, here is a detailed tutorial on how to make your own Legend costumes. Mike’s costume as Jack was as accurate to the movie as affordably possible, and he did purchase brass chainmail just for this costume. 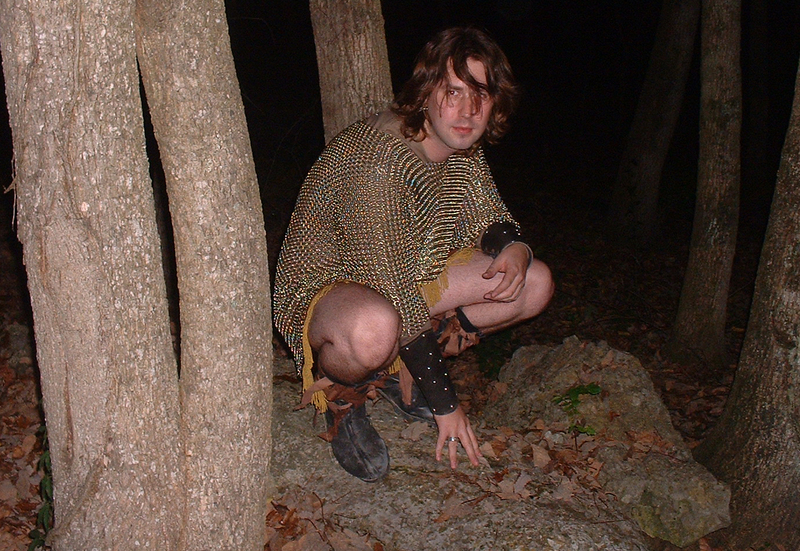 Brass scalemail, which is what Tom Cruise wears in the movie, is not easily purchasable or manufacturable. On to the costume. The main piece of the costume is the glittery armor, that one article makes the costume. 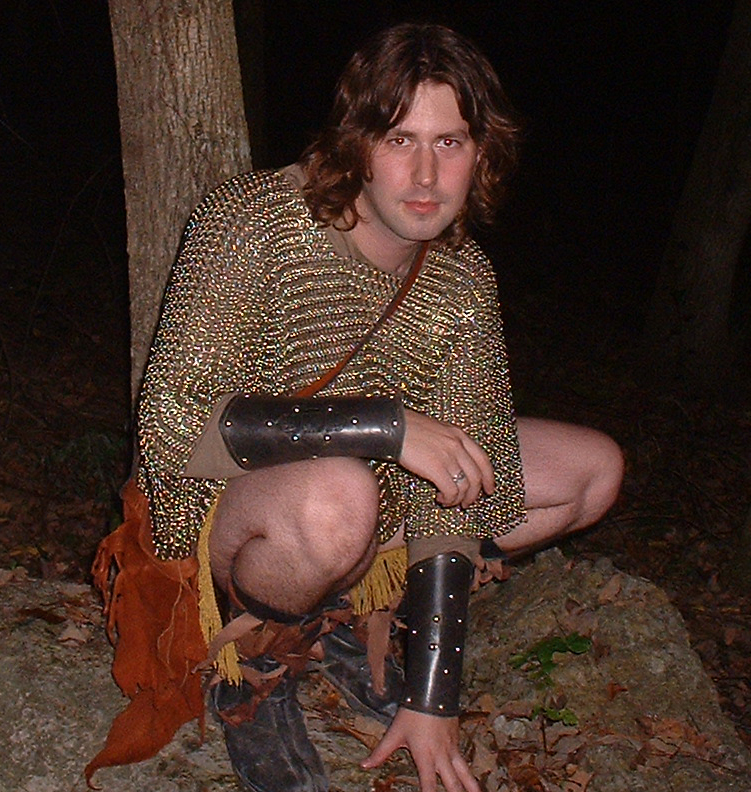 For this, Mike bought brass chainmail online. It is easy to find with a simple google search. The bracers, leather pouch, and boots are standard items easily found at Renaissance Festivals. The boots are from Son of Sandlar. The final piece is the great 1980’s hair style. You can’t buy those locks, you have to spend months growing them. The most involved and difficult of the three costumes, Darkness took the most planning and the most work on Halloween day. The total time on Halloween was between 4 and 5 hours of make-up. With the following tutorial, you should be able to shave some of that time off. Here is a list of the items used to make this costume. Black wig – this is a standard black witch wig. May be available for sale on our website soon. Styrofoam Horns – the kit for sale has about 5 inch horns, I cut and shaped the custom horns, which were over 1 foot in length. Due to time constraints we wrapped them in black duct tape. THE MOST IMPORTANT THING, make sure they are light weight. 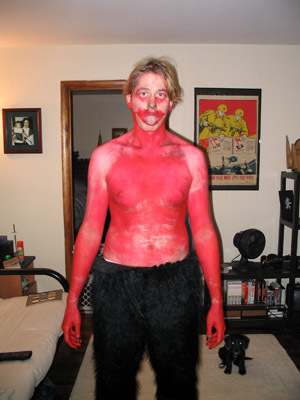 Red body paint – this is not the standard cream make-up we sell on our website. We plan to carry full body make-up in the near future. Hooves – these are not what I would have liked to have worn, but it was a last minute work around. Since I was mostly outdoors in low light, most people couldn’t get a close enough view to see them. This is the same problem as faun hooves. Random black cloth strips – these are for a “belt” and dangles hanging in front of the furry pants. 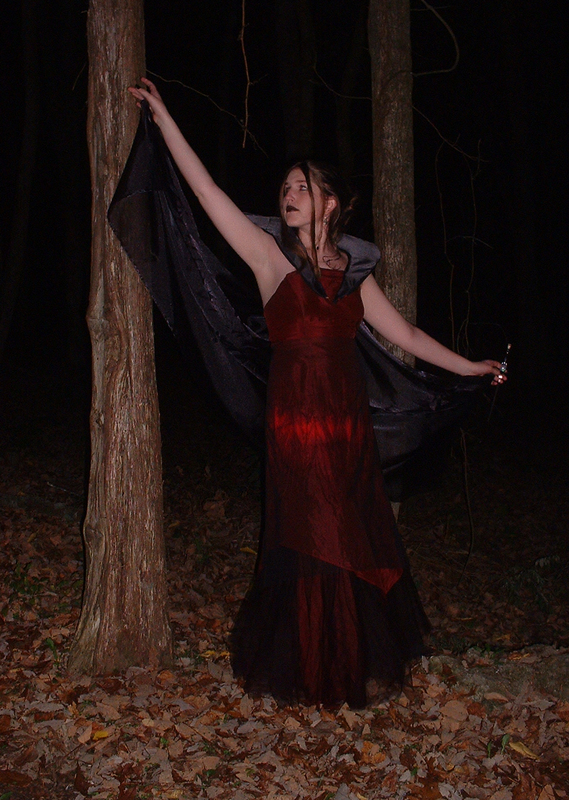 black cloak – Halloween is quite cold, the cloak helped hide my back and shoulders and kept me warm. 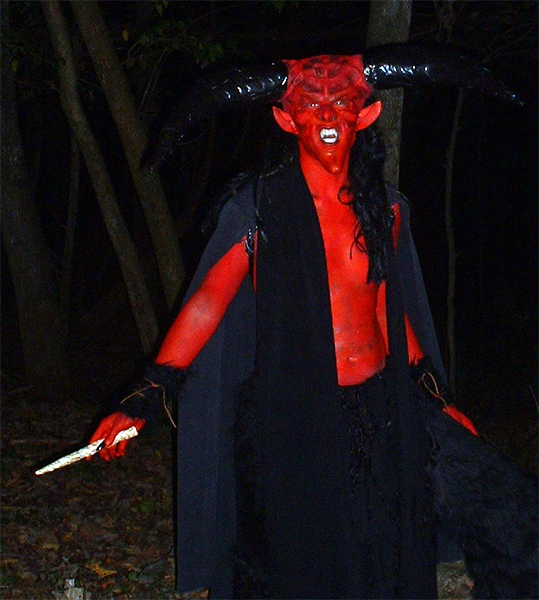 The horns were the most difficult to produce, and the most painful part of the costume. 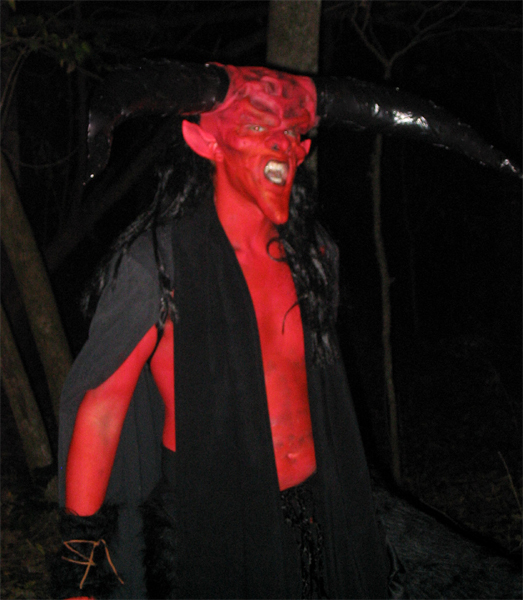 My horns were too heavy, and thus pushed against my temples all night. It is very important to build and design light weight horns. Aradani Studios is currently working on producing a pair, but until they are ready, make sure the horns that you make are light. I suggest making a headband with the horns attached to it, with a cross band going from horn to horn (ear to ear over your head). 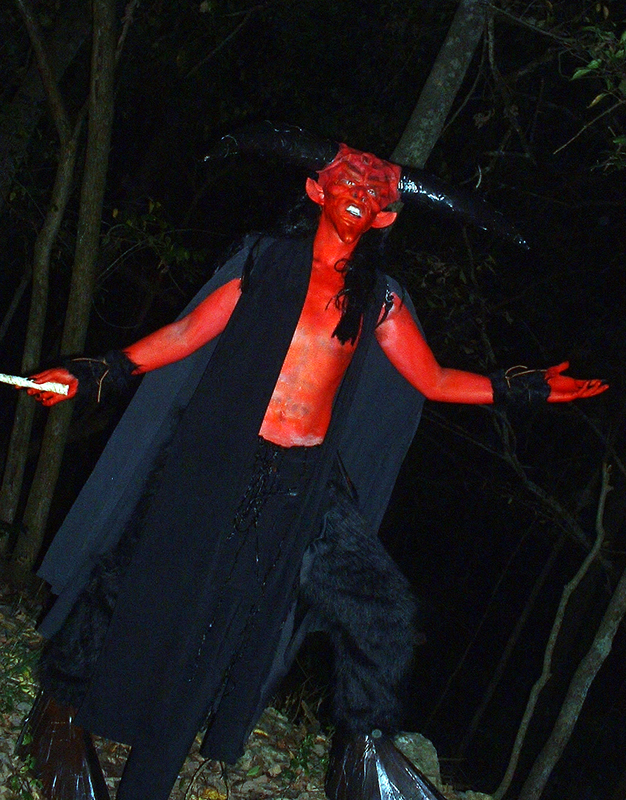 The main thing to remember if doing a Darkness costume is that there are some “movie magic” tricks that are insanely difficult to pull off. We went with a wig due to the time and difficulty making a baldcap hide all of my hair. It is always good to find small shortcuts that look great, but shave off a chunk of time, even though thye may not be 100% movie accurate. My sister Sara dressed the part of Lily. Her dress was a thrift store find, converted with a special collar. 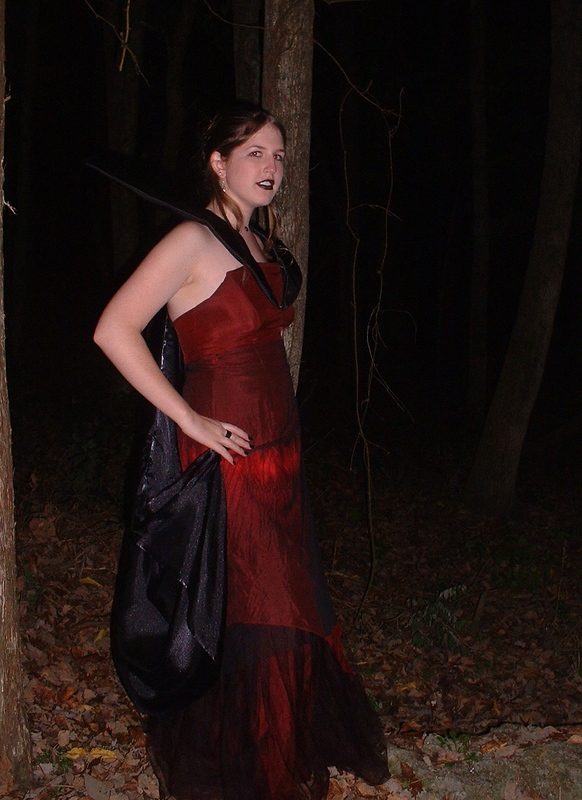 Grab some black lipstick, and add a simple black half-cloak and you are done. And after taking off all of the Darkness costume, this is what you are left with. And after cleaning off the red make-up, you are left with a very pink, very dirty bathtub.